The world's first ColdFusion monitoring tool. Buy Now OR Questions? Chat with us. Same great core functionality, plus a whole lot more. Goodbye Flash! The console has been 100% rewritten as an Angular.js-based, fully mobile-ready user interface. 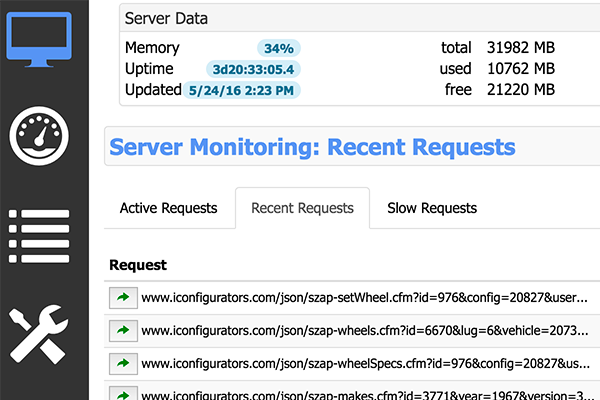 Create and analyze snapshots of server performance, including isolating bottlenecks. In-app incident reports, based on thresholds you configure, so that you no longer have to go to the database for this info. That's right—now SeeFusion can protect against both inside AND outside threats. What used to be a separate stack trace analysis tool is now built-in. 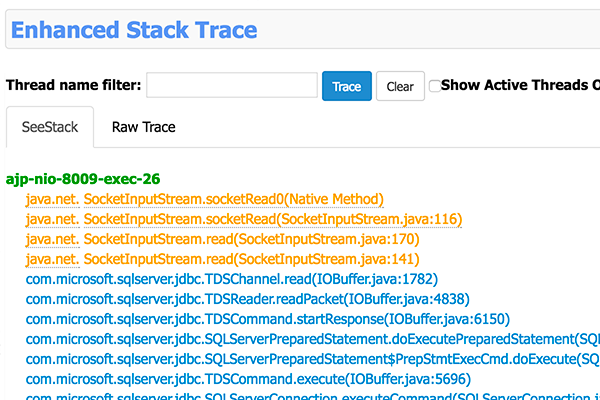 Get enhanced stack trace interpretation right inside SeeFusion. Our engineers are literally on your server. Chat with us live, from any screen in SeeFusion, right from your server. For the first time ever, we're offering a catalog of paid support plans that allow you to get the best possible performance and stability from your systems. We're now offering a new hourly licensing model that allows for ease of use in dynamic cloud environments (e.g., when running containers). For systems hosted in the Amazon cloud, SeeFusion now integrates with CloudWatch and other AWS services such as autoscaling. Now it's possible to have your AWS hosting infrastructure intelligently respond to metrics critical to your CFML application's uptime and stability. A closer look at some of the new features we've created for you in SeeFusion 5. The SeeFusion console has been rewritten 100%, and is now an Angular.js-based, fully-responsive interface. You can now access SeeFusion from any mobile device, allowing you to keep an even closer eye on your servers. Our goal as always been to give you as much problem-solving intelligence as possible. Server profiles take this feature of SeeFusion to the next level. 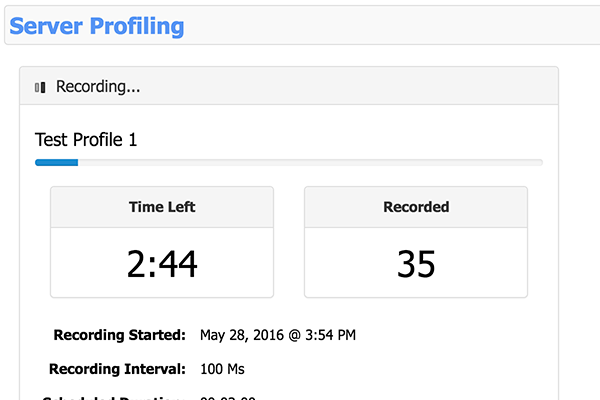 Record and save profiles based on intervals you determine, and then analyze them right in the SeeFusion console. Your profiling results will identify your problem areas, and will even pinpoint them down to the line number in your code. Since 2004, SeeFusion has been running on the busiest CFML servers in the world. 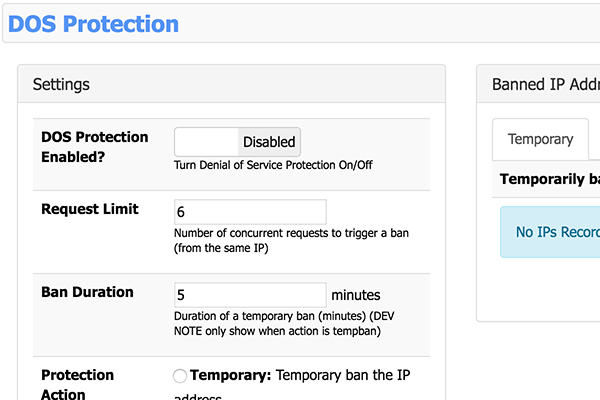 A Denial-of-Service attack will often push busy servers beyond their ability to perform, and that's why we've included a simple form of DoS protection right inside SeeFusion. Another improvement in SeeFusion 5 is making it clearer as to which areas you should focus on for optimum performance and stability. 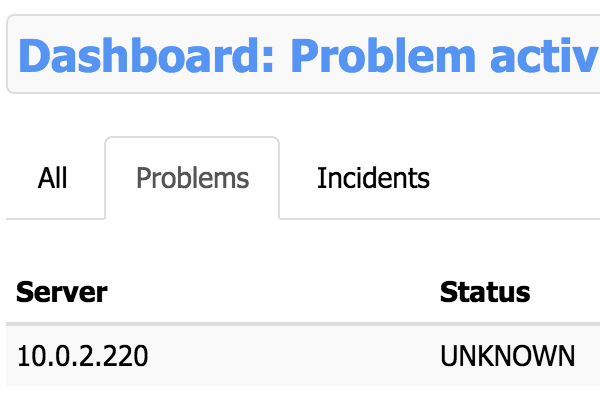 In SeeFusion Enterprise, the Dashboard now has a separate screen that will display servers that are struggling, along with configurable incident reports, making it even easier for you to keep track of your systems. Still struggling to make sense of stack traces? We've incorporated our SeeStack functionality right into the SeeFusion console. Stack traces are color-coded, with tooltip explanations of the various parts of a trace, helping you zero in on problem areas of your code and systems. We've always looked for ways to get closer to our customer systems. Short of traveling to your datacenter, our new live chat support system is the best solution we could find. 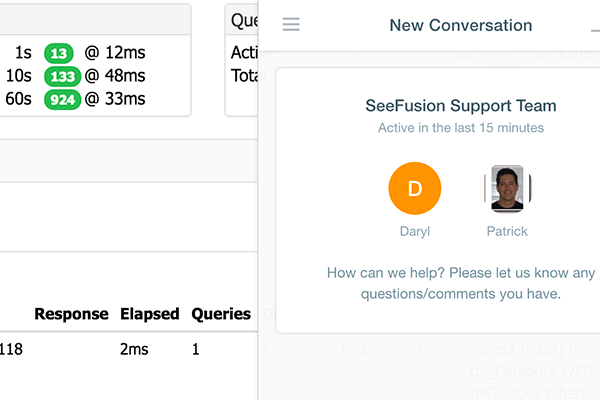 From any screen in SeeFusion, just open a secure chat window, and our performance engineers will be available to discuss your questions/problems. With AWS CloudWatch integration, you can now write critical system metrics like memory usage, active or long-running requests, and more, into AWS's powerful CloudWatch service, and then configure intelligent system responses such as autoscaling. 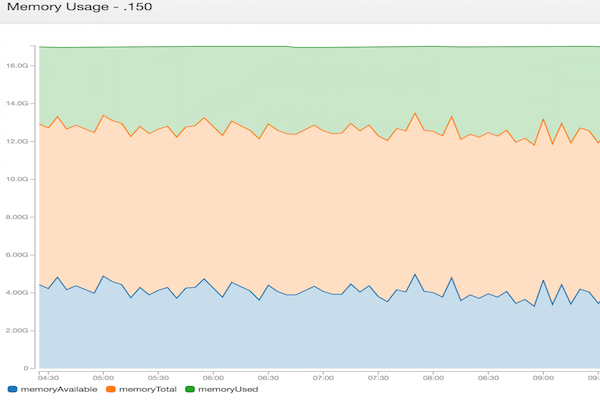 In this screenshot, ColdFusion's (or Lucee's) internal memory usage metrics are being written to CloudWatch, where services like ELB healthchecks and autoscaling can remove unhealthy servers, add more servers, or even scale up server memory allocation, as needed. 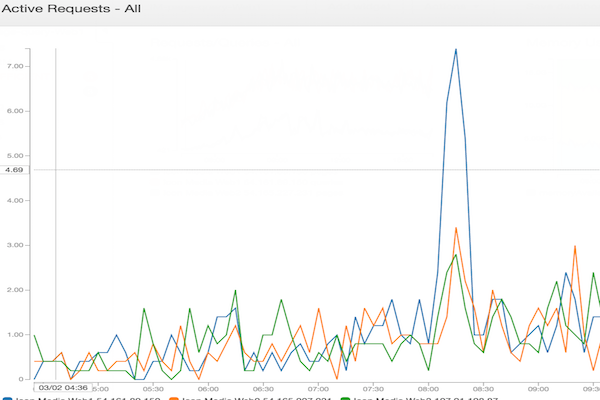 In this screenshot, SeeFusion reports to CloudWatch that one server in a cluster experienced a spike in active requests, allowing CloudWatch to redirect traffic, and/or increase cluster capacity, as needed. Same affordable pricing + new hourly-pricing model! For realtime monitoring, troubleshooting and tuning of simpler, lower-traffic systems. For fully-featured monitoring, troubleshooting and tuning. For fully-featured monitoring, troubleshooting and tuning in cloud/elastic environments. As part of launching SeeFusion 5, we built a brand-new, intelligent hosting infrastructure in our fully-managed Amazon cloud. We'll soon be setting up a new live demo so you can see the product in action. Consecutive days of server monitoring. A SeeFusion license is required for every server monitored (physical or virtual). Licenses may be transferred from one server to another, so long as the number of servers running SeeFusion never exceeds the number of licenses purchased. SeeFusion is provided "AS IS", with no warranty of any kind, either express or implied, including, but not limited to, the implied warranties of merchantability and fitness for any particular purpose. IN NO EVENT WILL WEBAPPER SERVICES LLC BE HELD LIABLE FOR ANY DAMAGES, INCLUDING ANY GENERAL, SPECIAL, INCIDENTAL OR CONSEQUENTIAL DAMAGES ARISING OUT OF THE USE OR INABILITY TO USE THE PROGRAM (INCLUDING, BUT NOT LIMITED TO, LOSS OF DATA, DATA CORRUPTION, SERVER DOWNTIME, OR LOSSES SUSTAINED BY YOU OR THIRD PARTIES, OR A FAILURE OF THE PROGRAM TO OPERATE WITH ANY OTHER PROGRAMS), EVEN IF SUCH WEBAPPER SERVICES LLC HAS BEEN ADVISED OF THE POSSIBILITY OF SUCH DAMAGES. USAGE RESTRICTIONS: You may not distribute copies of SeeFusion or SeeFusion License Key Data to others. SeeFusion contains proprietary trade secrets, and in order to protect them, you may not decompile, reverse engineer or disassemble SeeFusion, or otherwise reduce SeeFusion to a human perceivable form. Additionally, you may not modify, adapt, translate, or create derivative works based on all or any part of SeeFusion. You may not circumvent the copy protection employed by SeeFusion.